That as well. They are very apprehensive about making any structural mods to the floor as well as having to purchase another floor for the TED for VB. I think if they can get seating for 1k that should be sufficient. +1 we don’t wanna ruin TED for Volleyball. If we can make the court and seating in Jim Jarrett Admin building look like either of Florida twins or UTSA’s basketball arena that will do. I call shenanigans on the scoreboard bit. I went to the beach volleyball event that was at The Ted and the scoreboard didn't come into play at all. Granted it was the old board but it's not like the new board has lost the ability to be raised higher. Not wanting to spend the money to do two core drills for anchor holes at The Ted is silly. Same for a small modification to the basketball court. Now after the full-on renovation of the Athletic Admin gym then sure it's probably not the best use of limited funds but we are not talking hundreds of thousands of dollars. I am not sure but the floor might also need different type of boards. I only played out door volleyball so i don't know jack about indoor courts and i assume the flooring needs to be different because body's slam the floor real hard sometimes. I am pretty sure you will not find one school that has their basketball and volleyball teams play on the same court. Let's hope we are not the first. (08-14-2018 06:40 AM)757ODU Wrote: I am pretty sure you will not find one school that has their basketball and volleyball teams play on the same court. Let's hope we are not the first. Unless schools are using old basketball courts... I think it's a fairly common practice. Well we wouldn't be the first. Had no idea. I don't like it. It would be really nice for the two sports to have their own facility. I knew there was some sort of shock proofing built into basketball flooring but i didn't know it was safe for volleyball too. Lets the body's slam the floor. (08-14-2018 06:53 AM)757ODU Wrote: Had no idea. I don't like it. It would be really nice for the two sports to have their own facility. Wiki shows how common it is. I don't think it would be the worst thing to have the flexibility to have easily our best venue hold more events. The list includes some brand new arenas as well like Cincy's fifth third. After a second look this might not be so bad if it only requires 4 holes to be drilled for clamping down both poles and if we can cover that up during the basketball. If you were being recruited to play volleyball, wouldn't a selling point be playing in one of the nicest mid-major arenas every home match? (08-14-2018 07:49 AM)odu09 Wrote: If you were being recruited to play volleyball, wouldn't a selling point be playing in one of the nicest mid-major arenas every home match? You can also spin it where ODU is one of the few schools that has a dedicated facility for Volleyball. 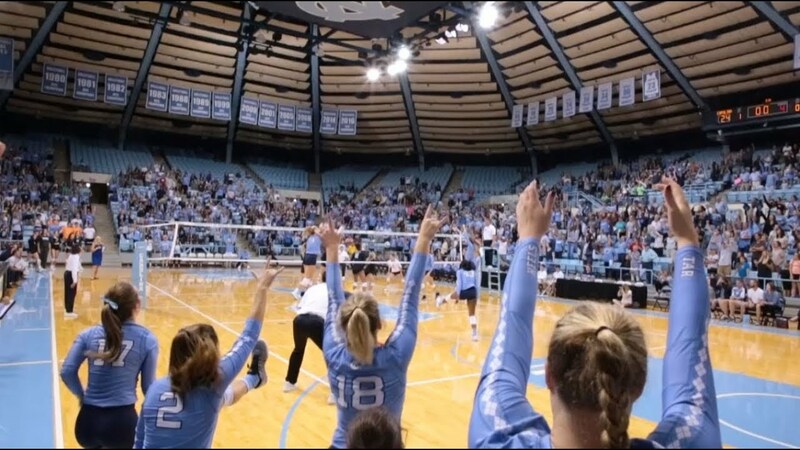 Also, since most volleyball does not attract the largest of crowds a dedicated facility will probably be louder/have a better energy than a 90% empty Ted. Wasn't there some talk about Beach Volleyball becoming a thing, too? (08-14-2018 08:38 AM)ODU_NYG Wrote: Wasn't there some talk about Beach Volleyball becoming a thing, too? If I'm not incorrect, the coach that ODU hires will pull double duty in coaching both indoor and beach volleyball. I know we have the volleyball court at Whitehurst, though I don't know how much would need to be done to make it NCAA compliant. EDIT: After some looking around, I can't find anything that actually mentions beach volleyball. Only mention is of indoor volleyball. Beach volleyball makes perfect sense considering our proximity to the beach. If we still used that effectively in our marketing it would help bolster the brand too. I'm somewhat surprised that the Ted wouldn't be volleyball-ready. It would be a good place for an NCAA regional or Final Four, or if Norfolk ever hosted state playoffs it'd be a logical place for boys' and girls' volleyball finals.